Clarence Hogan, 87, has been pinched by big jumps in his out-of-pocket costs for prescription drugs. The Globe is investigating age discrimination in the workplace. Tell us about your experiences confidentially here. 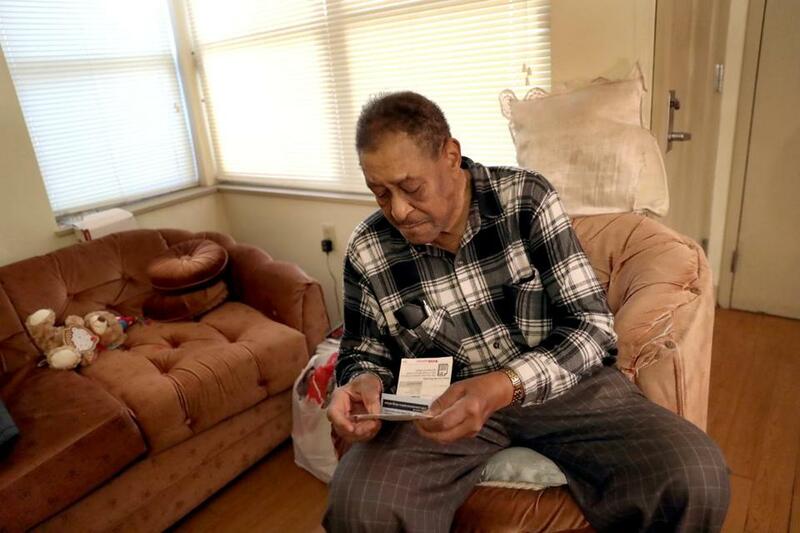 Every morning in his Roxbury apartment, 87-year-old retiree Clarence Hogan lifts a plastic inhaler and breathes in a powdery mist to treat his chronic lung disease. The medicine doesn’t come cheap. In 2017, his out-of-pocket cost for an inhaler loaded with a month’s supply was $27. But when he went to pick up a new one last fall, he was stunned to discover the price had more than quadrupled, to $345 for a three-month supply. Lowering the cost of prescription drugs is a perennial issue in Congress and on Beacon Hill. But in the face of industry opposition and divided government, older Americans like Hogan — covered mainly by private Medicare drug plans — may have to wait until after the next election for relief. Drew Altman, president of the Kaiser Family Foundation, said that although members of both parties have cosponsored bills to contain drug prices, “it’s not clear that either side wants to give the other a victory to talk about” in the current toxic political climate. Proposals introduced on Capitol Hill this month include ideas that allies of the drug industry have blocked in the past, such as allowing patients on fixed incomes to buy cheaper drugs from other countries and permitting Medicare to negotiate prices for its 44 million beneficiaries. Some price-cutting advocates see a reason to hope this year will be different, citing bold rhetoric from both President Trump and new liberal members of Congress. At a time of political gridlock, they say, controlling drug prices might emerge as a rare area of bipartisan agreement. Polls by the Kaiser Family Foundation, a nonprofit focusing on health policy research, found bringing down drug prices is a top priority among voters of both parties. And important advocates are jumping into the battle. Advocates are closely watching a bipartisan bill proposed earlier this month by Senator Amy Klobuchar, Democrat of Minnesota, and Senator Charles Grassley, an Iowa Republican, who chairs the Senate Finance Committee. The bill would prevent drug companies from paying competitors to delay the introduction of low-priced generic drugs. Such measures face a steep uphill climb. Potential presidential candidates, including Senators Elizabeth Warren of Massachusetts and Bernie Sanders of Vermont, are also among the sponsors of new legislation, which includes measures to cap out-of-pocket costs and to let the government manufacture generic drugs. But some see these proposals less as serious legislation than as “platform positions” that can be fleshed out in presidential campaigns. “They’re framing policies and building an agenda for after 2020,” Altman said. Health policy watchers say the likeliest reforms in the short term may come through administrative channels. Alex Azar, the US health and human services secretary, for example, has proposed rules tying the prices of some Medicare drugs to what other advanced nations pay and requiring companies to list the prices of drugs in television ads. In recent months, AARP opened a dialogue with the Trump administration on lowering drug costs. And it’s seeking to rally members around the issue on social media. Closer to home, state Senator Mark C. Montigny, a New Bedford Democrat, plans to file legislation that would require biopharma companies to justify their prices by disclosing how much they spend on research, manufacturing, and marketing. Montigny said the bill also will seek to control state spending on drugs for MassHealth, the state Medicaid program. A similar Montigny proposal passed the state Senate in late 2017 as part of a broader bill to control medical costs but died in a conference committee last year. Montigny complains many lawmakers on Beacon Hill were “afraid to take on the industry,” an anchor of the Massachusetts economy. But looking ahead, he’s more optimistic. The drug industry, meanwhile, blames rising costs on cuts in insurance payments by employers, health plans, and middlemen known as pharmacy benefit managers. Slashing drug prices, they warn, could dry up capital crucial for research into lifesaving therapies. But such arguments are becoming a “much tougher” sell, conceded Bob Coughlin, president of the Massachusetts Biotechnology Council. “We’re being portrayed as the greedy boogeymen,” Coughlin said. “But we’re the ones that are going to come up with cures for Alzheimer’s, cures for Parkinson’s, cures for ALS. We need a payer system that can absorb the upfront costs of these drugs and account for the costs avoided” when they render intensive care and hospitalization unnecessary. The industry is proposing alternative cost-containment measures, including “value-based” drug pricing in which insurers pay drug makers only when medicines are effective in helping patients meet health measures — pricing models that wouldn’t require government involvement. A recent Twitter exchange between Warren and Coughlin both underscored the strong feelings in Massachusetts — a state that’s been in the forefront of health care access and developing breakthrough therapies — and augured the issue’s importance in the 2020 presidential campaign. Patients like Hogan, the retired Raytheon technician, benefit from cutting-edge medicines but also feel the financial pinch. Hogan, like many his age, takes multiple prescription drugs. His medicine cabinet holds nine medications, ranging from a statin for high cholesterol to a blood thinner for atrial fibrillation to his inhaler for chronic obstructive pulmonary disease. All told, he spent about $2,000 last year on prescriptions, in addition to the premiums he pays for his Medicare drug plan. The Globe is investigating age discrimination in the workplace. Tell us about your experiences at bostonglobe.com/age-discrimination. Robert Weisman can be reached at robert.weisman@globe.com. Follow him on Twitter @GlobeRobW.